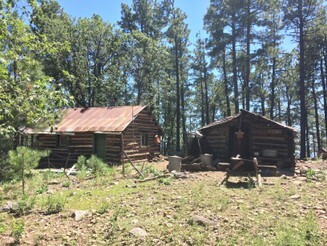 Once the Apache National Forest was established in 1908, the Forest began developing administrative sites, lookouts, telephone lines, and ranger stations. Bear Mountain Lookout was one of these, and was originally constructed in the 1910s as a simple, wood platform. Later, a corral and small cabin were constructed to provide shelter for lookouts who would spend months at a time on Bear Mountain. This year’s trip to Bear Mountain is intended to identify hazard trees, trees that may be appropriate for use in repairing the log structures, and to identify trees that need removal to improve historic view shed conditions. This project will involve some hard work – and a hard climb. But, the vistas from atop Bear Mountain are tough to beat, and the forest we will be working in abounds with beauty of all sorts. We hope you will join us this summer for this preliminary phase of the Bear Mountain Lookout project!